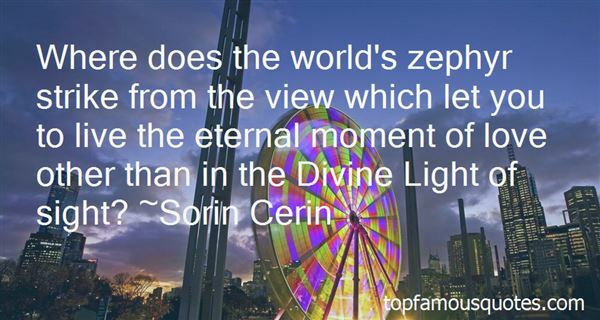 Reading and share top 26 famous quotes and sayings about Zephyr by famous authors and people. Browse top 26 famous quotes and sayings about Zephyr by most favorite authors. 1. "This is the circus of Dr. Lao.We show you things that you don't know.We tell you of places you'll never go.We've searched the world both high and lowTo capture the beasts for this marvelous showFrom mountains where maddened winds did blowTo islands where zephyrs breathed sweet and low.Oh, we've spared no pains and we've spared no dough;And we've dug at the secrets of long ago;And we've risen to Heaven and plunged Below,For we wanted to make it one hell of a show.And the things you'll see in your brains will glowLong past the time when the winter snowHas frozen the summer's furbelow.For this is the circus of Dr. Lao.And youth may come and age may go;But no more circuses like this show!" 2. "She could have rambled with all the fervor of a woman who had loved one entity for longer than most races live, and with the inviolable, unquestioned certainty found in dementia. There were references dated and sealed with meticulous care which she would have enthusiastically opened with the mirth of one proclaiming a lifetime of honors and awards. But that singular event was freshly disturbed; its pores still drifted on the faint zephyr of remembrance." 3. "George: 'Ringo would always say grammmatically incorrect phrases and we'd all laugh. I remember when we were driving back to Liverpool from Luton up the M1 motorway in Ringo's Zephyr, and the car's bonnet hadn't been latched properly. The wind got under it and blew it up in front of the windscreen. We were all shouting, 'Aaaargh!' and Ringo calmly said, 'Don't worry, I'll soon have you back in your safely-beds." 4. "I would rather the man who presents something for my consideration subject me to a zephyr of truth and a gentle breeze of responsibility rather than blow me down with a curtain of hot wind." 5. "Gormenghast. Withdrawn and ruinous it broods in umbra: the immemorial masonry: the towers, the tracts. Is all corroding? No. Through an avenue of spires a zephyr floats; a bird whistles; a freshet beats away from a choked river. Deep in a fist of stone a doll's hand wriggles, warm rebellious on the frozen palm. A shadow shifts its length. A spider stirs... And darkness winds between the characters.- Gormenghast"
6. "Gods, how I've missed you. (Stryker)I hate you with every beat of my heart. (Zephyra)"
7. "Your father abandoned us. (Zephyra)I know. You've told me that enough that it's permanently seared into my brain. Still, he's a part of me and I'd like to have closure. (Medea)You really need to stop watching Oprah. (Zephyra)"
8. "A clever enemy would kiss my hand, then stab at my back while I was distracted. (Stryker)A coward's action. Truly. Don't insult either one of us with such a suggestion. I don't believe in petty juvenile attacks. I go after what I want, and when it's the life of an enemy I don't want there to be any mistaking my intention. If you're worth my hatred, then you're worth my letting you know that I'm coming for you. (Zephyra)"
9. "You bit me? (Stryker)We use what we have. (Zephyra)That's such a girl move. (Stryker)But it works. Maybe if you fought like a girl and not a stunted baboon, you'd actually win. (Zephyra)"
10. "I'll abide by my word, but you will never win me back! Believe me, in two weeks I will slice open your throat, drink from your blood, and then pierce your heart and laugh while your body explodes into dust. (Zephyra)Beautiful imagery. You should write for Hallmark. (Stryker)"
11. "Swear it on your life. (Zephyra)That I can never do. (Stryker)Why can't you? (Zephyra)Because you are my life, and I can't live another day without you. (Stryker)"
12. "You'd better. Otherwise Stryker and I will feast on your innards, bathe in your blood and I will use your eyes as earrings. (Zephyra)You know, with imagery like that, you should write for Hallmark. (Jericho)"
13. "She's my wife. (Stryker)Was. You seem to have forgotten an important verb tense. (Zephyra)"
14. "I'm giving you that chance now. (Stryker)It's too late. Too many centuries have passed. There was a time when I lived only to hear a kind word from your lips. But that ship sank under an assault of bitterness that no amount of charm or guile will recover. (Zephyra)"
15. "So I conjured one of the brokers and promised him my soul if he'd protect her. (Zephyra)You can't do that. Only a demon can. (Stryker)You're such a brainiac, baby. And to think, I thought I married you for those amazing abs. Who knew all that brainpower was buried under those bulging biceps? (Zephyra)"
16. "I have my work cut out for me where you're concerned, don't I? (Stryker)Not really. Hate you today. Will hate you tomorrow. What say we don't waste any time? Give me the sword and let me have your throat now. (Zephyra)"
17. "Should I warm the oven and bake you a batch of hero cookies? - Zephyra"
18. "A woman after my own heart. (Stryker)You're absolutely right about that. Nothing would please me more than ripping that organ out of you and feasting on it. (Zephyra)"
19. "One single word and I swear I'll rip your tongue out. (Zephyra)"
20. "Then know that I'll be laughing at your ineptitude every time your enemies strike you, and if you fail to return with my daughter, I'll have your heart and your head for decorations. (Zephyra)Your words are noted, my most prickly rose. And I shall endeavor to keep your amusement at a bare minimum. (Stryker)"
21. "What is he? Your personal lie detector? (Stryker)Something like that. (Zephyra)Why don't you tell him the truth? I'm your pet dog you keep chained up so he won't piss on your floor. (Jared)"
22. "Trust me, baby, you weren't that good. I was just a better actress than you were actor. (Zephyra to Stryker)Ew! No offense, Mum, I don't want to know who you've slept with. Kill the sexual bantering and him before I go deaf from it. (Medea)"
23. "It's what made her the warrior she is. She hates all humans for their cruelty, just as I do. They are all animals fit for nothing but slaughter, and I enjoy wholeheartedly playing the butcher. (Zephyra)"
24. "I have you here. Why shouldn't I be pleased? (Stryker)I can think of a million reasons, starting with the fact that I want to kill you more than I want to breathe. As for the others, would you prefer them in order of importance or alphabetically? (Zephyra)"
25. "Where does the world's zephyr strike from the view which let you to live the eternal moment of love other than in the Divine Light of sight?" 26. "Those horses must have been Spanish jennets, born of mares mated with a zephyr; for they went as swiftly as the wind, and the moon, which had risen at our departure to give us light, rolled through the sky like a wheel detached from its carriage..."
Does not the very word 'creative' mean to build, to initiate, to give out, to act - rather than to be acted upon, to be subjective? Living photography is positive in its approach, it sings a song of life - not death."